Noida-headquartered Uflex showcased its first CI flexo printing press – the Uflexo on 8 March, 2018. Available in two models, Elisa and Valle, the gearless flexographic printing press has been developed in collaboration with Italy-based Comiflex SRL. The two companies signed a technology transfer agreement during Drupa 2016. The company showcased Elisa, an 8-colour press which can print upto 400m/ min. while Valle’s running speed is 300m/min. Both the models are available with six to ten printing stations and printing width of 800/1600mm. Tandon says that Uflex is better equipped to develop such a machine because it’s the only machine manufacturer in India which has its own converting facility. 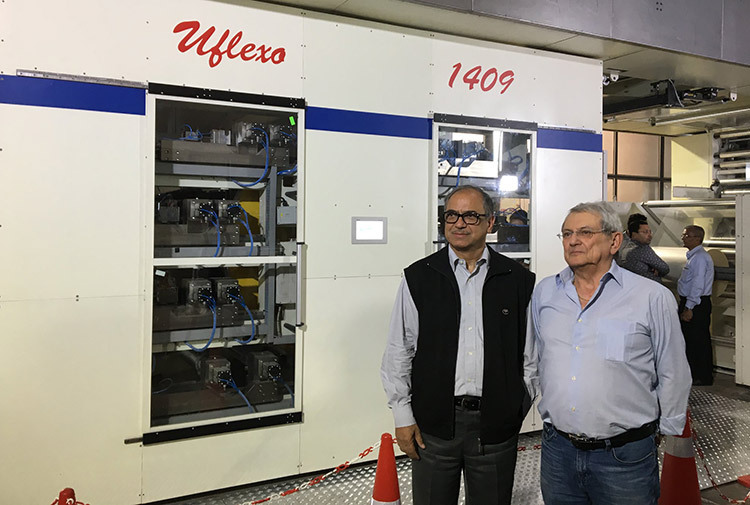 The Technology Transfer Agreement which was signed between Mr. Gianfranco Nespoli, Owner of Comiflex SRL and Mr. Ajay Tandon, President & CEO, Engineering Business, Uflex Limited to market and sell these machines across the world were signed at drupa 2016. Sanjay Malik Sabharwal, executive vice-president, engineering business, Uflex, said that the technology transfer from Comiflex was really helpful in developing the machine. The company has also used a patented technology to reduce the consumption of solvent in cleaning the press, bringing it down from 100% upto 10%. This not only saves on solvent but also on time and energy. In Uflexo there is no bouncing of plates and it’s easy to use the printing press. Tandon said the reduction in the bounce has been made possible because of the way the machine has been built. So far the company has received three orders - one for export and two for the domestic market. However, as a matter of practice, Uflex always uses the first batch of its newly developed machines in-house. Even the CI flexo machine showcased during the launch will go to its converting business.